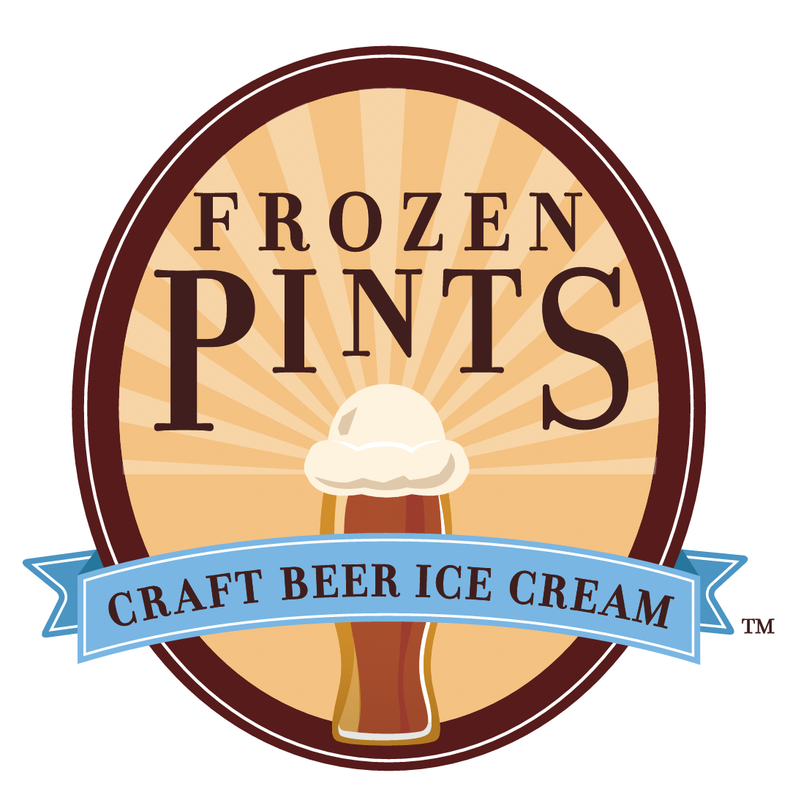 What do you do with some Frozen Pints Craft Beer Ice Cream and a bottle of Hanger 24 Chocolate Porter? 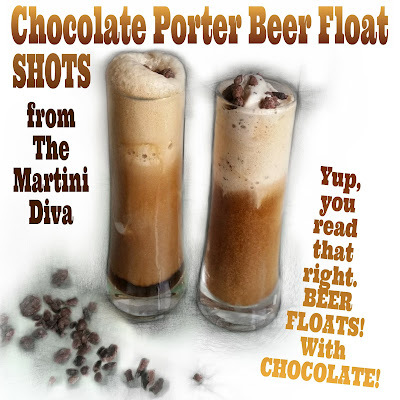 You make Chocolate Porter Beer Float Shots! 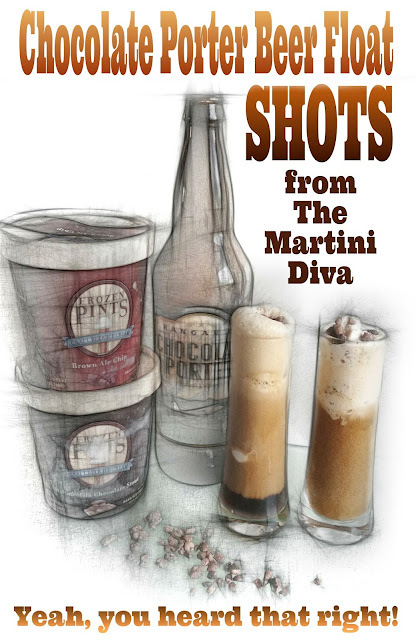 Frozen Pints sent me several varieties of their Craft Beer Ice Cream, among them was their Brown Ale Chip and their Malted Milk Chocolate Stout and, since beer floats are kind of a thing lately I bought a bottle of Hanger 24 Chocolate Porter and made a duo of Beer Float Shots. And before you cringe, try them! I'm not a real beer fan and I loved them both! The Chocolate Chip was my favorite of the two, but I'm really fond of malt balls so that one went down pretty easy too. Both are really simple, simply delicious and easy to make. The ingredients for each are below and the directions are just below that. DIRECTIONS for BOTH: Fill your shooter (or pint glass) HALF full with the Chocolate Porter, pouring down the side of the glass to keep the head minimal. Allow the head to settle for a minute then scoop 2 balls of ice cream with the melon baller (shooter) or the ice cream scoop (full size). Sprinkle on the garnish and enjoy! If you're looking for an unusual dessert these would be a perfect surprise for guests. Serve them up with some chocolate chip cookies or brownies and you have an easy, unusual adult treat. 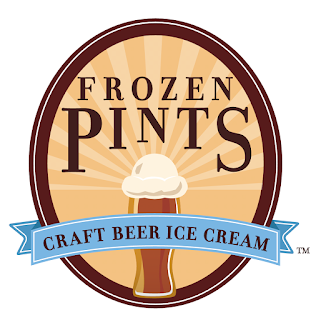 I was sent samples from Fernet Branca and Frozen Pints/The Ice Cream Bar and while concocting recipes with both accidentally discovered they worked together like a dream. 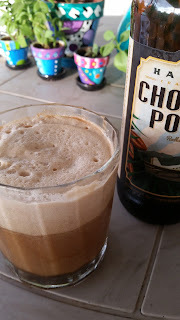 I put together some beer floats with some chocolate stout for the ice cream post and then, because I still had most of the gynourmous bottle of chocolate stout left, decided to grab the Fernet Branca and a bottle of Sailor Jerry spiced Rum. Hey, I couldn't let that 22 ounce bottle of chocolate stout go to waste, could I? 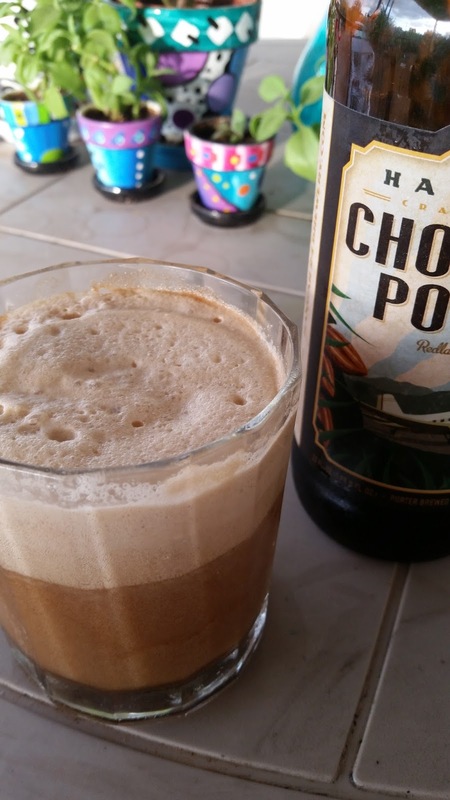 What I ended up with tasted amazingly like a very boozy chocolate root beer float at the start. It began fairly sweet with a hit of bitter at the sides of the palate but if you added more of the chocolate stout as you drink, which I did, it got more mellow and changed character. 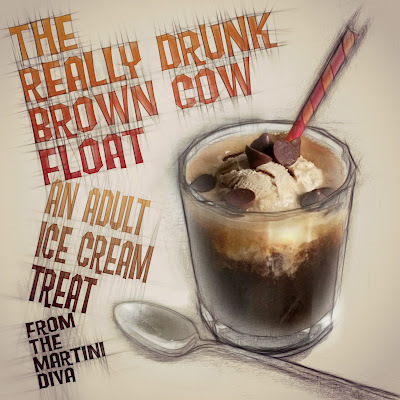 The ice cream slowly melts as you add more stout and you end up with a creamy, foam topped chocolate licorice tinged cocktail. You also get to enjoy it longer and appreciate the change from sweet to somewhat bitter as you drink. DIRECTIONS: Chill your glass in the freezer. Add the Fernet, Rum and Crème de Cacao to a cocktail shaker filled with ice and shake until well chilled. Strain into your chilled glass. Top off with chocolate stout, gently slide in a big scoop of the ice cream, sprinkle with dark chocolate chips, slide in a straw and ENJOY! Why do I drop the ice cream in last? Because if you put the ice cream in first it will form ice crystals on the outer layer as the warmer liquids come in contact with it and it will also foam more and create nasty air pockets that make your drink experience less pleasant.